I'm with rez.. Of course! 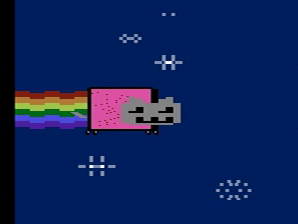 It turns out that drawing Nyan Cat on the VCS is fairly tricky. This thing uses all graphic objects the TIA is able to produce, including the missiles and ball for the tail, left edge and cherries on the tart. The cherries were the last thing to go in, since I didn't have enough CPU time to change COLUPF to red and back to blue without messing something up, and still have time to read/write the HMBL/ENABL values. I do not like all these cats shitting a rainbow ! Just for historical fact, when the first one was done ? You could save some cycles by copying the data to the ZP during VBLANK and using "LDA ZP,Y" instead of "LDA (ZP),Y". Also by tweaking the colors, you could re-use the color values for the "ENAx" bits like "LDA #$8A:STA COLUBK:STA ENAM1". Aaah, coding VCS soooo nasty. rulez added on the 2011-08-15 10:08:30 by JAC! By the time 2012 rolls around, it's probably retro and cool again. I think it takes some knowledge of the 2600 to truly appreciate just how tricky this is. JAC! : I assume you mean LDX ZP,Y - there's no LDA ZP,Y. Also, with four bytes to spare there's no room for another table in RAM. Reusing color values for ENAx is a good idea for future prods - this time I needed to set HMBL though, meaning the lower bits in that table were free for ENABL. In retrospect I think it would have been possible do P1's job using the playfield and careful timing, freeing it up for use as a nicer tail. The detuned tones and funked/lagged drums makes this pretty lol. .. and I'm even in the greetings, thanks! added on the 2011-08-15 13:51:45 by JAC! But hey, that's what the demoscene's all about, ne? It's really hard to keep sane proportions with the VCS graphics. Cool job with the music as well. FINALLY!!! Nyan Cat landed on Atari platform, yahoo!!! THUMBS UP!!!!!!!!!!!!!!!!!!!!!!!!!!!!!!!!!!!! I guess the demoscene is complete now. We can all rest. What Plek and Duckers said. nice the flying cat-series continues. who's gonna bring it further? Makes me want to rip the music and make an Atari 7800 version. A lot of pwz in it! zomg I know what it is going to be..
Exin: I assume you mean the rainbow tail, which would mean moving the cat/tart right. The problem with that lies with how playfield graphics work. ATM I'm using a repeated playfield, which means I'd have to move the thing 4*(4+8) = 48 pixels to the right, landing the thing almost on the right edge of the screen. With a reflected playfield I could reduce that to 32. However, reflecting the playfield would mean I don't have time to clear the rainbow graphics in PF2 before it's drawn again for the right side, meaning the rainbow colors would bleed into the tart. Moving the thing horizontally is not feasible. Nyan + platform -> thumb! NYAN, and NYAN NYAN too. page created in 0.020689 seconds with 15 queries.